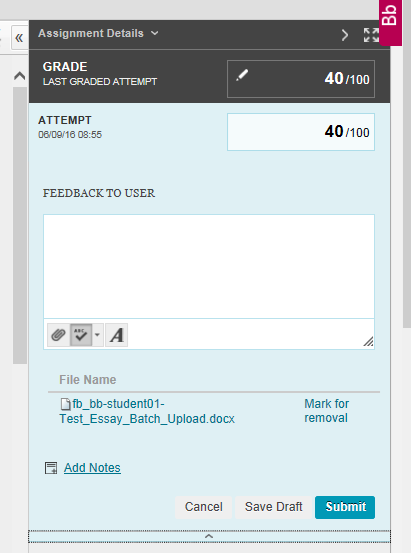 The Advanced Assignment Tool (aka Batch Upload Tool) in Blackboard enables you to batch upload feedback file attachments to the Grade Centre for individual assignments submitted online. It is not recommended using the tool at this time for batch uploading feedback for group assignments. (It can also be used for downloading student papers for bulk upload to Turnitin). Before you begin, familiarise yourself with the considerations and possible risks associated with the Marks and Feedback tool, and speak with a colleague from your faculty TEL team. Step 1. Expand Control Panel, then Customisation, then Tool Availability. Step 2. Scroll down the Tool Availability page and select Advanced Assignment Tool. Click Submit. You first need to download the student submissions that you wish to mark and provide feedback against. This stage will create a package file containing the student submissions. If you are marking a sub-set of students (e.g. students in a specific tutorial group), you may wish to consider creating those student groups prior to downloading the student submissions as the tool allows student group membership to be automatically selected. You can then extract the student submissions in the original file format in which they were submitted and the Excel file that the package file contains. Extract the files to a directory that you can easily locate. Now you can start generating the feedback. You might annotate against the original student work in the files that you extracted from the package file or create separate feedback files (e.g. a cover sheet or feedback grid). When creating feedback you need to ensure each file is named or resaved using the format of 'fb_username'. If you are providing a feedback grid, consider using the HWB Feedback Spreadsheet that will automatically name the feedback files correctly. Ensure that you enter the marks for each student in the grade column in the Excel file that you extracted along with the student submissions and save this in the directory along with the feedback files you have created. (Please note that you should use Internet Explorer when opening the link to the HWB Feedback Sheet, and then save a copy when it has opened in Excel). You can then begin preparing to upload the feedback files. Start by creating a package file containing the feedback files and the Excel file containing the marks. You complete the final stage of checking that the upload has worked correctly by choosing a student's attempt in the Grade Centre and opening the feedback file that has been attached. Step 1. Expand Control Panel, then Site Tools, then click Advanced Assignment Tool. Step 2. Click Download against the assignment to mark and provide feedback for. Step 3. Select the students for which you wish to mark and provide feedback for and click Submit. Selecting the check button next to Username will select all students who have made a submission. There are additional filtering/selection options below the list of users. You can select all ungraded attempts, or where student groups are set up in your site you can select by group membership by clicking on the Group Name. Step 4. You will see a processing screen. Wait for the process to finish and click Click here to continue. You will promoted to save the downloaded package file. Save this to a location that you can easily locate, and ideally in a new folder. Step 5. From your chosen save location, double click to open the zip file. Select the Excel spreadsheet and all folders (hold Ctrl and click each item). Step 6. Unzip the file by clicking Extract followed by OK. The Excel document and a folder for each student should appear in your saved location. Step 9. Open the Excel document, add marks in the grade column for each student and save the file. You must not rename the Excel file otherwise the upload process will fail. Step 10. From your save location, select all student feedback files or student folders (if containing the feedback files) and the Excel spreadsheet file. If the .zip file exceeds 250MB, you will need to reduce the number of feedback files that you are attempting to upload and complete the process in batches. You can check its size by locating the .zip file, right clicking on the file name and selecting Properties. Step 12. Return to the Blackboard site you wish to upload the feedback files. Expand Site Tools and click Advanced Assignment Tool. Step 13. Click Upload, and browse to add the newly created zip file (created in step 11) and click Submit. Step 14. Click Click here to continue followed by clicking OK. Make sure that no errors are reported at the top of the screen. Step 15. Click Release Grades (this releases the grades to the Blackboard Grade Centre not to the students). Step 16. Click Click here to continue followed by clicking OK to complete the process. Make sure that no errors are reported at the top of the screen. Step 17. Expand Grade Centre and click on Full Grade Centre. Step 18. Find the assignment column for the assignment you uploaded marks and feedback for and make sure the grades match. Step 19. Click the chevron next to a student's mark and click Attempt (Date Submitted). Step 20. Within the attempt section, click on the chevron to reveal the feedback file. Click on the feedback file to open.